If you’ve been searching for a capable, family-friendly SUV with available all-wheel drive, the 2019 Toyota Highlander just may be at the top of your list. Of course, reliable performance on Palm Beach County and West Palm Beach streets isn’t the only thing that sets this vehicle apart. When you step inside this SUV’s spacious cabin, you’ll have dozens of high-tech amenities and modern conveniences, right at your fingertips! Take a closer look at Earl Stewart Toyota of North Palm Beach today. Entune™ App Suite: Upgraded Toyota Highlander models are available with the Entune™ App Suite. In addition to offering simple, customizable controls for your infotainment features, Entune™ connects drivers and passengers to tons of useful apps, like Yelp, iHeartRadio, and Destination Search. Driver Easy Speak: Tired of having to shout when you want to get the whole cabin’s attention? With Driver Easy Speak, you can transmit your voice directly through the rear speakers with just the press of a button. Rear-Seat Entertainment System: When upgraded, the Highlander may be optimized with a rear Blu-Ray-compatible entertainment system, which includes two sets of wireless headphones, RCA jacks, a 9-inch display, and more. If you want to move equipment that can’t quite fit in your Highlander interior, don’t fret: the Highlander has no trouble towing heavy cargo. A properly-equipped Highlander can tow 1,500 pounds with its baseline 4-cylinder engine, and up to 5,000 pounds with its available V6 and all-wheel drive. 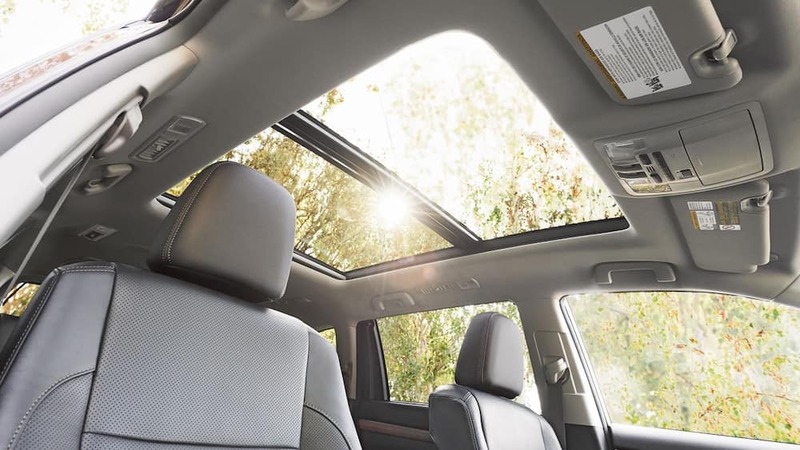 If you like what you’ve seen of the 2019 Toyota Highlander interior so far, you’ll love how you feel behind the wheel. This SUV is easy to care for and maintain, and it compares well against competitors like the Ford Explorer! If you’re ready to take the next steps, schedule a test drive in any new Toyota Highlander for sale at Earl Stewart Toyota of North Palm Beach, serving Jupiter and Palm Beach Gardens.